A modern mobile phone is a highly complex electronic system made up from a variety of diverse sub-systems, all of which must work seamlessly together. Today's users have very high expectations which set tough demands on manufacturers as they introduce third generation technology. While quality, in terms of the phone's stability, performance and behaviour on the network, originate from good design, the only way to be sure of quality is by testing it. This makes testing a very important part of any mobile phone's life cycle, from development through to manufacture and beyond, touching a number of different disciplines and departments. Testing UMTS is divided in three sections. Section One provides an overview of major types of testing and the organisations and tasks involved. In particular it looks at what is involved in conformance testing and device certification. Section Two is more technical and looks at the UMTS standard itself, working through the protocol layers. Future trends and their impact on testing mobile devices are examined in Section Three, including the emergence of new technologies both in the access network and the core network and the evolution of new testing methodologies. Offers advice on products, services and resources that aid the testing process. 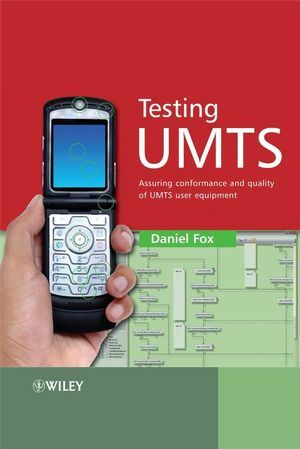 This book is an ideal text for engineers and managers who are either directly involved in the process of testing UMTS mobiles, or who are looking for an understanding of what is involved in testing. Professionals involved in the development of UMTS mobiles, integration and verification, conformance testing, operator acceptance testing, manufacturing and servicing will find this book indispensable. Daniel Fox currently works for Anritsu - the world leader in measurement systems for ISDN optical communications — as Director of Technology. He has overall responsibility for system architecture for the company's wireless test and measurement platforms. Daniel has been at Anritsu since 1999 and, prior to his appointment as Director of Technology, managed the business unit responsible for protocol test software solutions for UMTS. He served as an official in the 3GPP standards programme, first as the Chair of the signaling sub-working group that developed the protocol conformance test specifications, and later as Convener of that group and Vice-Chair of the terminals working group. Before joining Anritsu Daniel worked for Motorola Semiconductors for almost 10 years. He has a degree in Applied Physics and Biology from the University of Wales, University College Swansea. 1.3. Overview of the Industry. 2.1. The history of UMTS. 3.1. The purposes of Testing. 3.2. The Expectations on an Equipment Developer. 3.3. Differences with Other Markets. 3.4. Testing Through the Life-Cycle. 5.6. Main Organizations Involved and Their Aims. 6.1. What is Interoperability Testing? 6.3. Ways in which Interoperability Testing is carried Out. 6.4. Typical sources of Tests. Part II: Testing by Layers. 8. Testing the Physical Layer. 8.1. Overview of the UMTS Wideband CDMA Physical Layer. 8.4. Interactions with GSM Technology. 8.6. RF Conformance Test Systems. 8.7. Testing the Baseband in Isolation. 9. Testing of Layer 2. 9.2. Testing the MAC Layer. 9.3. Testing the RLC Layer. 9.4. Packet Data Convergence Protocol. 10. Testing of Layer 3. 10.1. Overview of the Network Architecture. 11.1. Protocol Test Systems (System Simulators). 13. High Speed Packet Access. 13.3. RF Tests for HSPA. 14. Future Trends in Testing. 14.1. Testing Earlier in the Development Cycle. 14.2. IMS and Technology Convergence. 14.4. Future Cellular Network Technologies. Appendix. Tree and tabular Combined Notation.